"Cruising Cuisine" is more than a cookbook. It is a story of how Elena followed her heart and her love of cooking. Each page shows Elena's devotion to entertaining. Now you can create cruise ship recipes and impress all your guests at your next party. Elena started her cooking voyage when she cooked with her father at the early age of 6. While she watched her father cook, he taught her an appreciation for cooking techniques she still uses in her cooking today. Some of her earliest memories include helping chefs make Russian Blini for French passengers. Years later, she was working as a cruise director when she met her husband, David Gevanthor. They now live in Plantation, Florida. 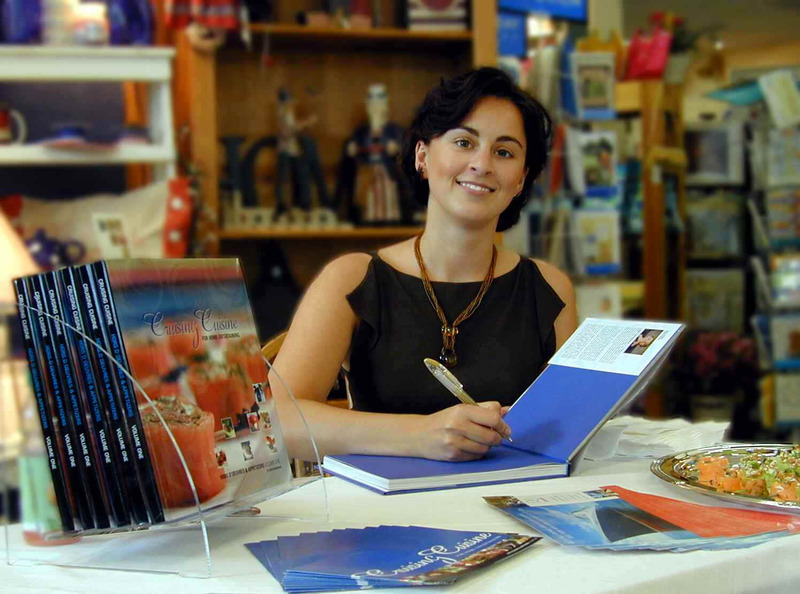 When Elena isn't cruising, entertaining guests at home, giving interviews or fascinating her cooking students with cooking demonstrations in her own kitchen, she is writing gorgeous cookbooks. "Cruising Cuisine" is the first book in a series of cruise themed cookbooks. Contemporary – Easy-to-prepare hors d'oeuvres and appetizers for the late afternoon or early evening. You will be enticed by recipes for Shrimp Salad Canapés, Mini Quiche Loraine and the imaginative Crab Salad appetizer in which a tomato and an egg are magically transformed into a whimsical "toadstool." The French Olivier Hors D'oeuvres made with Belgian endives are sure to add a touch of elegance to your parties. There are even some vegetarian favorites. Premium – This section introduces recipes with an added element of creativity. There is a wonderful recipe for delicate "Fillo Shells filled with Smoked Salmon & Lemon Dill Cream." I personally loved the recipe for "Salmon Wellington." The recipe makes 8-12 pastries you can freeze up to 1 week ahead of your party. I added a sprinkling of sesame seeds before baking. I made double the recipe as I knew this was going to be a winner. I cut two sheets of pastry into 12 rectangles (6 rectangles each) and transformed this recipe into an elegant dinner. I really felt like a chef while making these pastries and was even more impressed with the results. They are excellent with a lemon-butter sauce and a side of the vegetables of your choice. How could a dish this tasty be so easy to make? Elena has made the instructions simple to follow and her recipes gave me a lot of confidence and an added sense of accomplishment. One of the best features of this book is that it is sewn to lie flat on your kitchen counter. If you love cooking from cookbooks, this is an added bonus. Luxury- Elena's experience as a chef is especially evident in the last chapter. The recipes are filled with innovative ingredients. You will find everything from "Lobster & Crab Cappelletti in Pistachio & Garlic Sauce" to the exotic "Sesame Encrusted Tuna Bites." All of the recipes are sophisticated and the "Smoked Salmon with Caper Cream & Caviar" features thin slices of salmon rolled up into a rose. 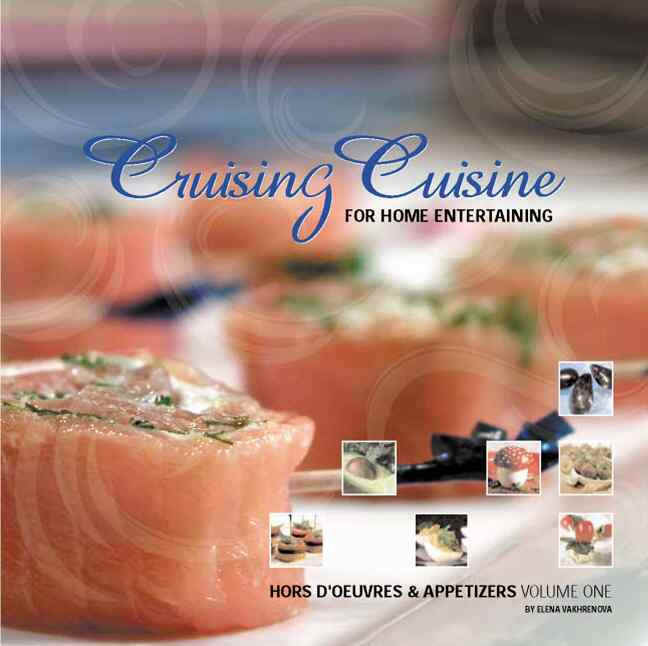 "Cruising Cuisine: For Home Entertaining" is filled with over 50 recipes and 120 photographs. Each recipe has vibrant color photographs of the finished dish and ingredients. Elena Vakhrenova is not only a natural in the kitchen; she spent six months photographing the food in her own kitchen. All the recipes are easy to read and have the ingredients are listed in bold text. The instructions are organized into the various steps and follow a logical progression. At the end of the recipe, Elena shows you how to present your dish in the most appealing way. I can't wait to try the "Lobster Spring Rolls" and the "Crab Cakes with Mustard Sauce." Garnishing and Serving Suggestions – Throughout the book you will find a number of secrets only a chef would tell you. Cooking Tips – Tips on how to keep lemons fresh for weeks, how to quickly peel tomatoes and how to add a tantalizing appeal to a variety of ingredients. A Glossary – Explains the main ingredients used in this book. Elena gives tips on how to find the best leeks and Portobello mushrooms. Mail Order Sources – Online sources for caviar, imported European food products, Market Delicacies and Cheeses. Helpful Cross-Referenced Index – The main ingredients used in this book are featured in a bold text. This cookbook also has "Cruise Discount Vouchers" for Carnival Cruises, Star Clippers and Cunard Line. I wish Elena all the success in the world as she sails into her future. I believe Elena will capture the attention of an even wider audience and I look forward to seeing her on a cooking show in the near future.